The Wedgewood on Boulder Creek has a variety of scenic photo options, from Boulder Creek itself to forest and mountain and canyon views. The Wedgewood is located just 5 minutes west of Boulder, which makes it easy distance for guests to stay in town while feeling like the venue is secluded and tucked away to let loose at. The venue has a dedicated outdoor ceremony space with an archway and lots of evergreen trees around it. There is also an indoor option if needed that still has nice views. For the reception you can either have it outdoors under a tent or in the historic building that has modern charms. Two rooms give you options for a wedding of 80 or 100 guests, or combine the two. 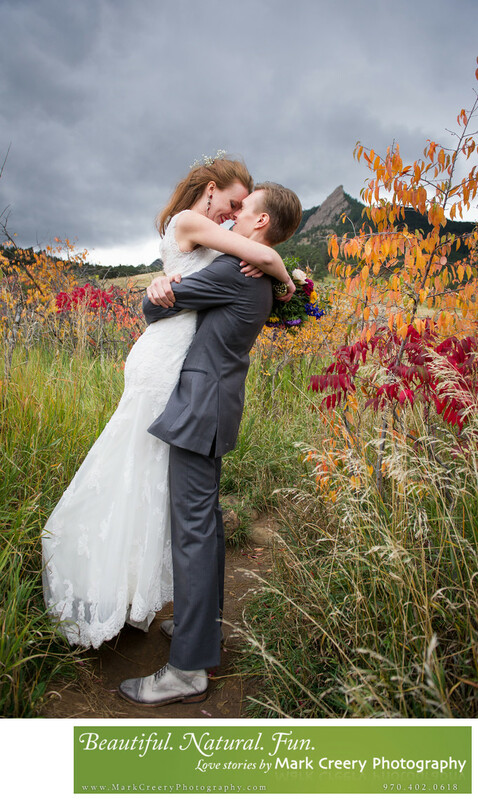 In this wedding photo, the couple and I stole away to nearb y Chautauqua Park for some different views of the Flatirons, only 8 minutes away from the venue. It was Fall in mid-October so the color on the foliage was impressive, with bright orange and red leaves. We didn't have to far off the main road to get this view with the most impressive rock face of the park in the background. The groom swept his bride of her feet, which showed off the train of her vintage gown perfectly. No wedding photo is complete for me without a great expression and connection between the couple, and you can clearly see how in love these two are. I love the brooding sky in the background which tells the story of the weather that day and creates some mood. I specialize in outdoor Colorado weddings and excel at showing off the scenery your venue offers while still focusing on your personalities and having fun. Get in touch if you're still looking for a photographer, as I'd love to chat. The Wedgewood Wedding and Banquet Center on Boulder Creek is located in beautiful Boulder Canyon just outside of Boulder, Colorado. Contact: (720) 466-7320, events@wedgewoodbanquet.com. Location: 38470 Boulder Canyon Dr, Boulder, CO 80302.